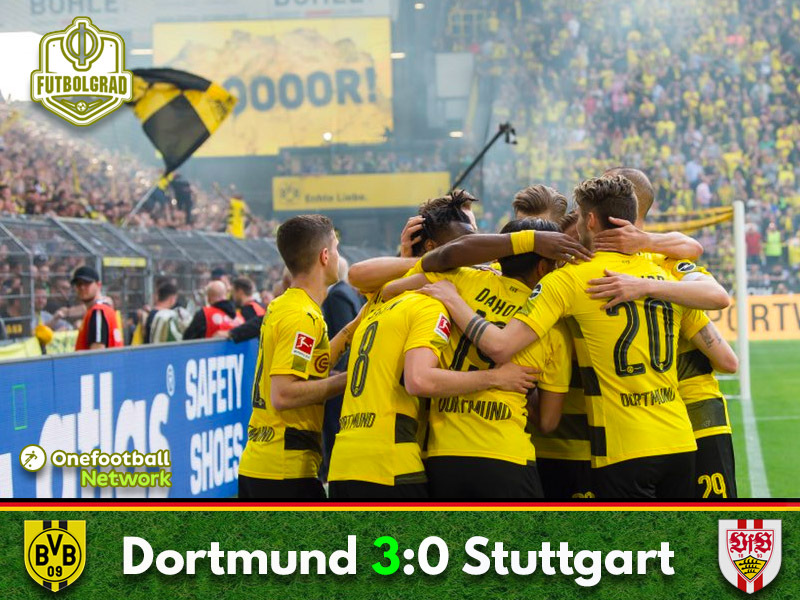 Wanting to make up for their heavy defeat against Bayern Dortmund started the match nervously but after a lucky Christian Pulisic goal the Yellow and Blacks dominated the match, and Borussia Dortmund vs Stuttgart ended with a 3-0 victory for the home team. Pulisic’s lucky cross led to Dortmund’s victory. Maximilian Philipp wins the man of the match award. VfB head coach Tayfun Korkut suffers his first defeat since taking over Stuttgart. Dortmund wanted to make up for last week’s heavy 6-0 defeat to Bayern München, but the Yellow and Blacks appeared nervous to start the match. Stuttgart, in turn, looked like the home team, to begin with, applying pressure on Dortmund early on. In the first 16 minutes, Stuttgart had 55% ball possession but failed to capitalise from a nervous beginning by Dortmund. In the 25th minute, Stuttgart had the first chance of the match. Mario Gomez was left wide open after Andreas Beck freekick, and his header went wide of Roman Bürki’s goal. Dortmund at this point were lacking ideas to create anything tangible. Unable to play out of the back thanks to a Stuttgart side that was pressing high Dortmund needed something special to get on the scoreboard. Christian Pulisic broke forward towards the byline and played in a cross that to the surprise of anyone in the stadium drifted towards the far corner of the goal beating Ron-Robert Zieler to bring Dortmund ahead in the 38th minute. The goal, as fortunate as it was, woke BVB up as the Yellow and Blacks finally started to take control of the match ahead of the halftime break and Marco Reus should have perhaps doubled the lead in the 44th minute when he was given acres of space in the box but his shot was wide of the goal. Within moments of the second half kicking off, Dortmund had doubled the lead. Forcing Stuttgart inside their box, Dortmund were picking the Swabians apart and after a great combination play between Mahmoud Dahoud and Nuri Sahin the ball fell to Michy Batshuayi inside the six-yard box and the striker simply tapped the ball home. Dortmund played like a transformed side and were now picking Stuttgart apart, and in the 60th minute, they got their third. Breaking forward with numbers Dahoud crossed the ball from the left to the far post where Pulisic dropped the ball off to Maximilian Philipp his first attempt was stopped by Zieler, but the forward jumped on his rebound to get the ball across the line. With the 3-0 lead in their back, the confidence was back for Dortmund, and the Yellow and Blacks possibly played their best football since Stöger took over the club. Dortmund continued to create chances. Pulisic (72′), Batshuayi (75′) were denied when breaking free from Stuttgart’s defence. Stuttgart, in turn, had just one chance in the second half with Mario Gomez rattling off a shot against the crossbar of Bürki’s goal in the 85th minute. Dortmund then controlled the game seeing out the fixture to come away with a deserved 3-0 victory. 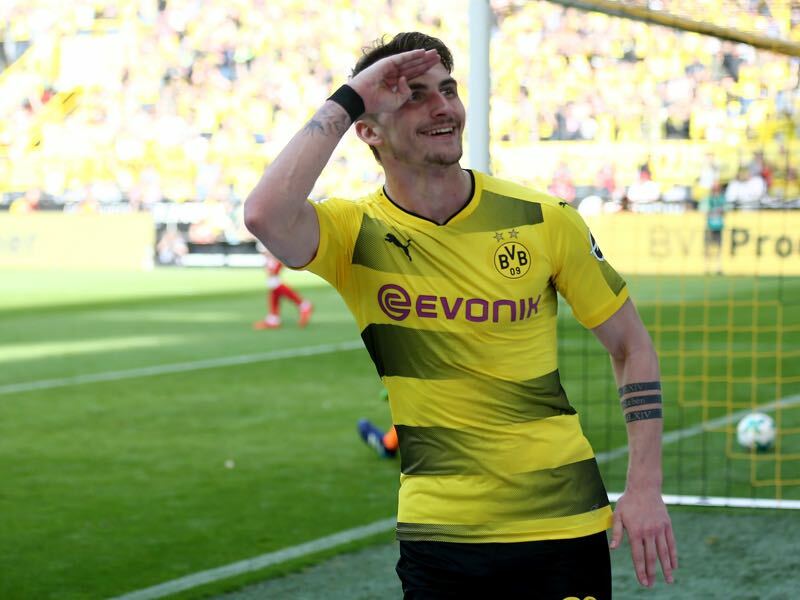 Maximilian Philipp was excellent in the second half. Highlighted by Chris Williams on last week’s Gegenpressing Podcast as the possible solution for Dortmund’s attacking woes the 24-year-old was fantastic in creating chances for Dortmund threatening Stuttgart every time he broke forward. He also scored Dortmund’s second goal and put in a terrific work rate winning nine out of 15 key duels throughout the match. André Schürrle and Mario Götze were both left off for the full 90 minutes. Instead, Stöger fielded Philipp, Reus and Pulisic behind Batshuayi and then brought on the talented Jadon Sancho and Sergio Gomez in the second half. Hans-Joachim Watzke had criticised Götze, in particular, ahead of the match saying that the World Champion has been heavily weighted down by scoring the game-winner at the World Cup four years ago and that playing for Bayern has not furthered his career. Like Schürrle, Götze has been out of form for weeks now, and with the World Cup going ahead in just 67 days the question is whether both are now going to be left out of Joachim Löw’s squad. So no Mario Götze and André Schürrle for #BVB today. Without the two Dortmund's were much improved and finally got going under Stöger. Now the question is has the #WorldCup train departed for the two Dortmund players? Michy Batshuayi has scored his seventh goal in his ninth Bundesliga game for Dortmund. Only Manni Burgsmüller managed to score his seventh goal for Dortmund this early in his career at the club (also in his ninth game). At his age (19 years, six months, 21 days) no other foreign player has scored as many Bundesliga goals as Pulisic (9). This was Stuttgart’s first defeat under head coach Tayfun Korkut. Going into the game Korkut had a record of W5 D3.